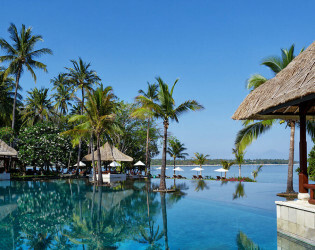 The Oberoi, Lombok is located on the Northwest coast at Medana Beach. Surrounded by fishing villages and palm groves, The Oberoi, Lombok nestles in a tranquil bay, a 20-minute boat ride from Gili Air, which is visible from the resort. 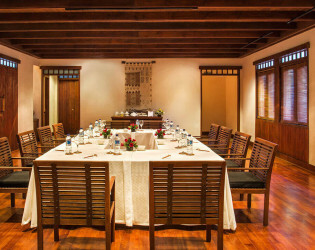 Full day: USD 75 net per person includes 2 times of coffee break & 1 time 2 courses lunch food only basis. 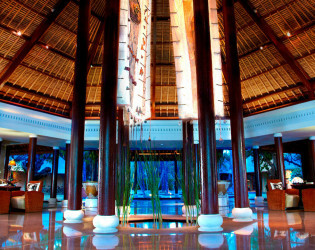 Half day: USD 55 net per person includes 1 times of coffee break & 1 time 2 courses lunch food only basis. LCD Projector: USD 50 net per day. 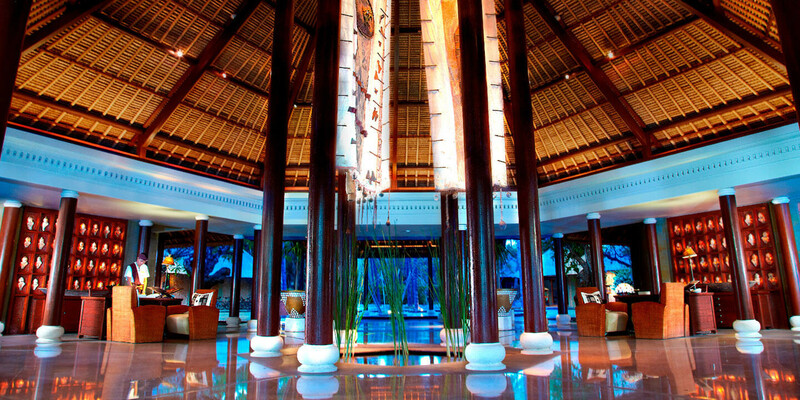 50 Rooms consisting of 30 Luxury Pavilions and 20 Luxury Villas. 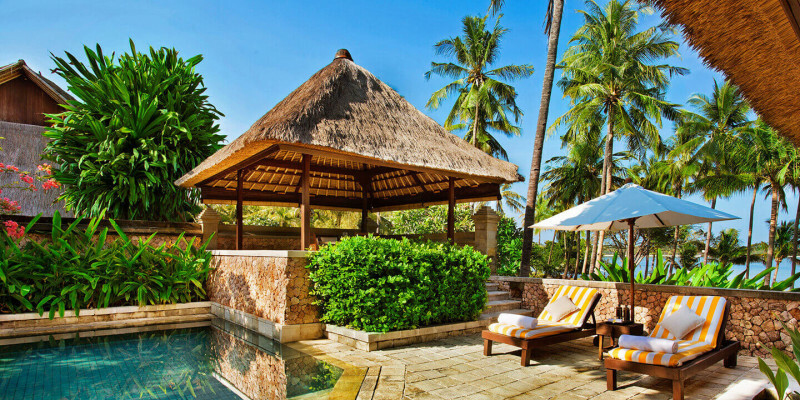 The Oberoi, Lombok is located on the Northwest coast at Medana Beach, near Tanjung, on 24 acres of landscaped sprawling lawns, studded with palm trees. 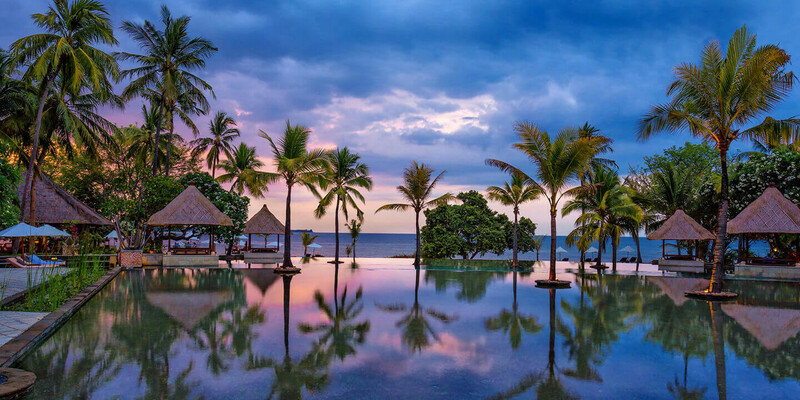 Officially opened in April, 1997, it is a scenic 2 hours drive north from Lombok International Airport (LOP) through the mountainous Buan Pusuk rainforest, winding down through small villages to the rugged coastline. 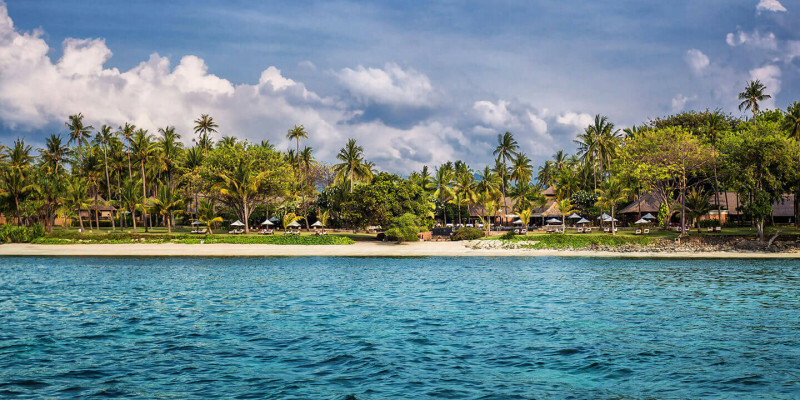 Surrounded by fishing villages and palm groves, The Oberoi, Lombok nestles in a tranquil bay, a 20-minute boat ride from Gili Air, which is visible from the resort. 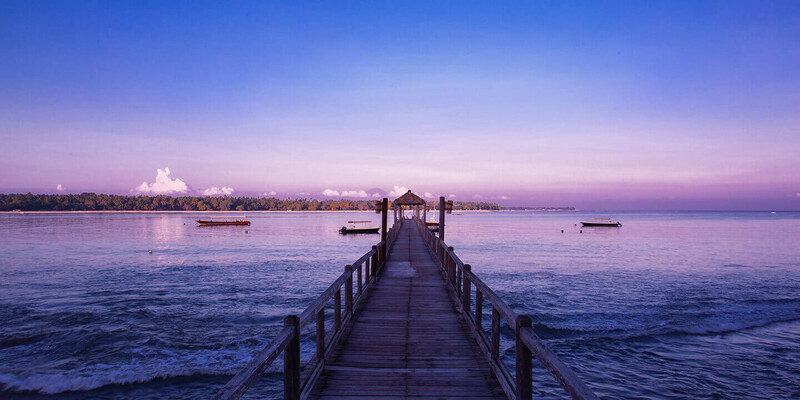 The three Gilis (islands); Air, Meno, and Trawangan, are renowned for their golden beaches and coral reefs for snorkeling and scuba diving. 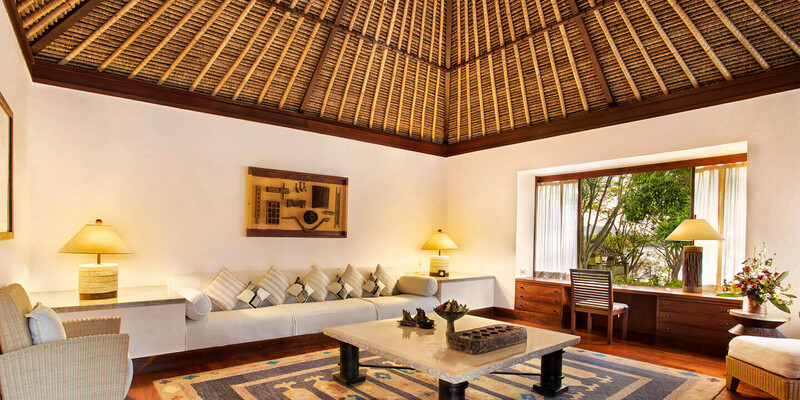 The Oberoi, Lombok would be more suitable for those who seek a serene, tranquil, peaceful ambiance and those who are seeking an experience stay within traditional style of resort in Lombok Island. 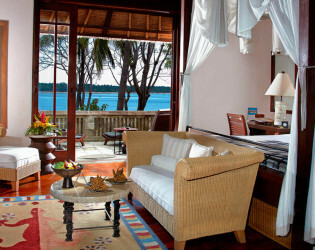 The resort has huge tropical garden and having a private beach beach amongst all other hotels in the area and all rooms are set in low rise thatched roof cottages and villas. 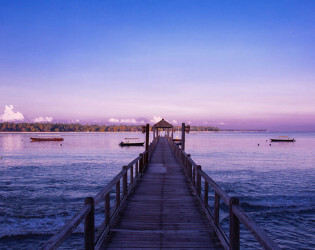 We have a private Jetty where the guest especially the group could arrive and depart directly from and to the resorts. The Dive Centre at The Oberoi's Beach Club is operated by PADI qualified instructors from H2O Sportz, an Australian company. 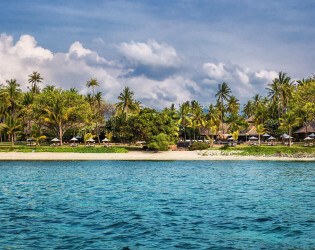 A traditional outrigger and three motor boats provide regular boat trips for diving instruction, casual snorkeling or just enjoying the scenic waters and secluded along the north west coast. Picnic lunches are provided for day trips and a sunset cruise is a great way to wind down the day. 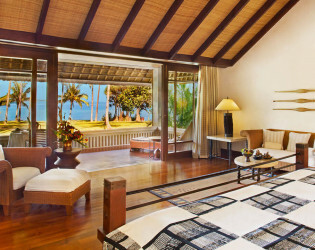 Windsurfing and snorkeling equipment are provided on Oberoi's beach, free of charge. 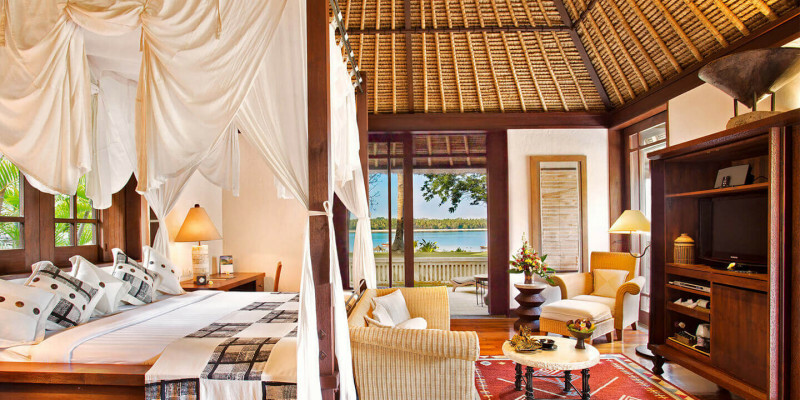 Trip to Gili is also could be arranged directly without going to the public harbour. Wi-Fi Internet connection in Meeting Room, LCD projector, Screen, White board, Flipchart, Writing Pad & Pen, and Mineral Water. Awards & Notables 2016 “Best Resort Hotels in Indonesia, ranked 4th” by Travel + Leisure, USA, World's Best Awards, Readers' Survey 2016. 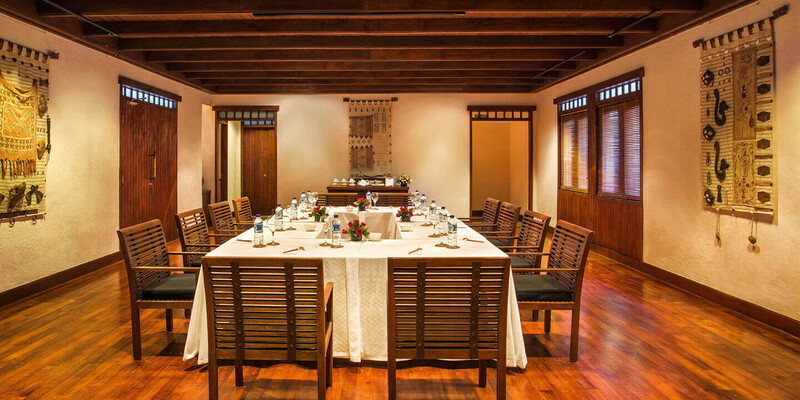 One small luxury meeting room which is suitable for those who are looking for intimate meeting, It has the range area of 100 sqm. 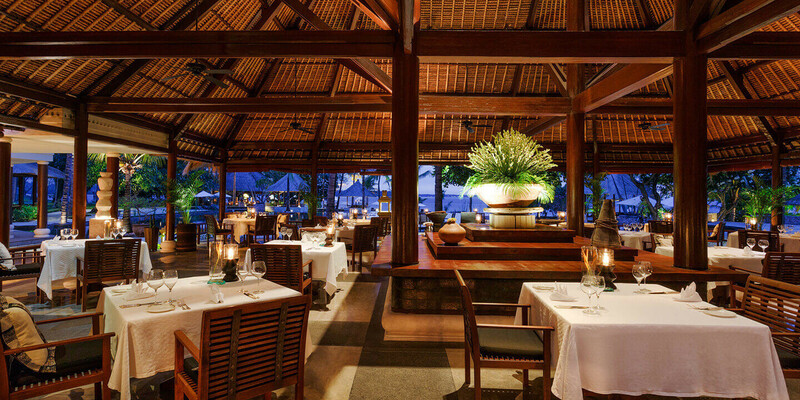 The Lumbung Restaurant is named after the traditional raised rice barns dotted throughout the island. 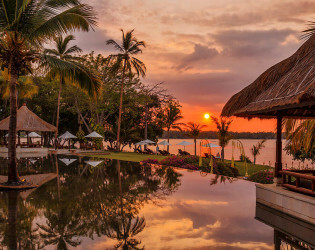 The elegant open-air thatched pavilion is situated in a landscaped coconut grove with extraordinary views over the resort’s central reflecting ponds reaching to the ocean. 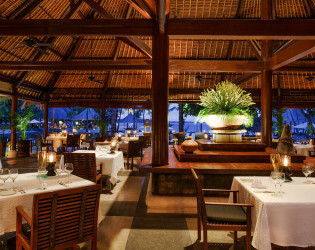 The menu includes a fine selection of Indonesian, Continental and Asian cuisine. Tokek Bar, named for the harmless, playful little lizards, this open-air bar serves snacks, drinks and tropical inspired cocktails. 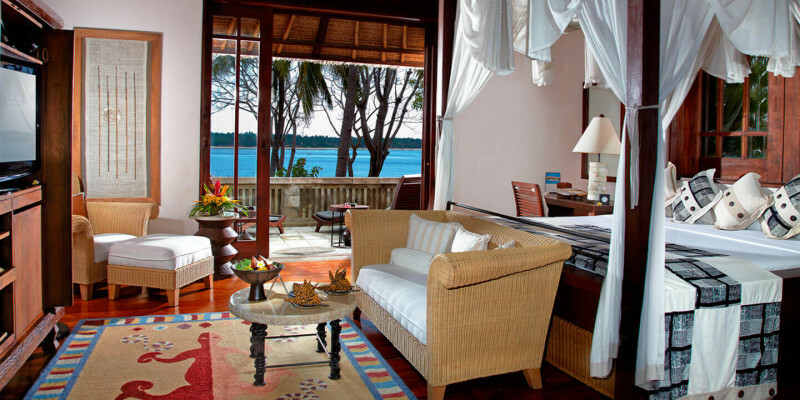 Gorgeous views of the shimmering sea dotted with fishing boats sets the scene to enjoy the relaxed pace of life here. 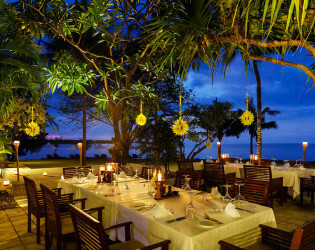 Relax and spend a romantic evening while watching a perfect sunset over Mount Agung in neighboring Bali. 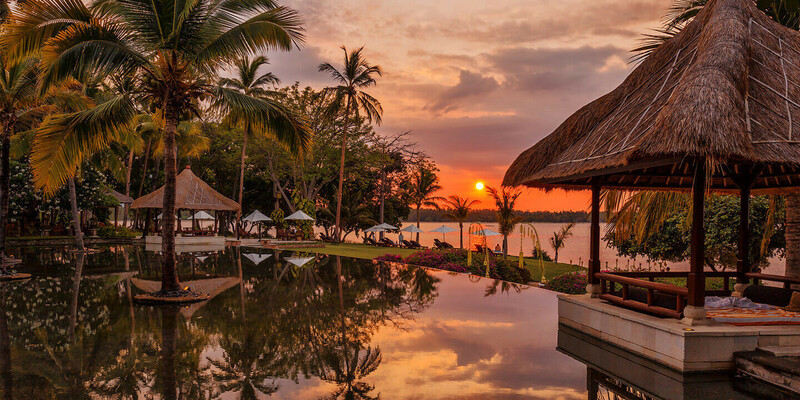 Just east of Bali on the beautiful island of Lombok, experience 24 acres of direct beachfront with views to the Gili islands and beyond. 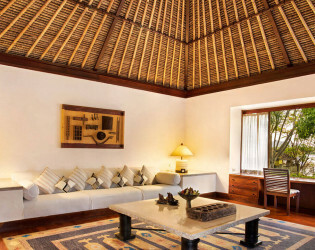 Twenty thatch-roof Villas and Thirty Pavilions are furnished in soft tones and primitive art of the region. 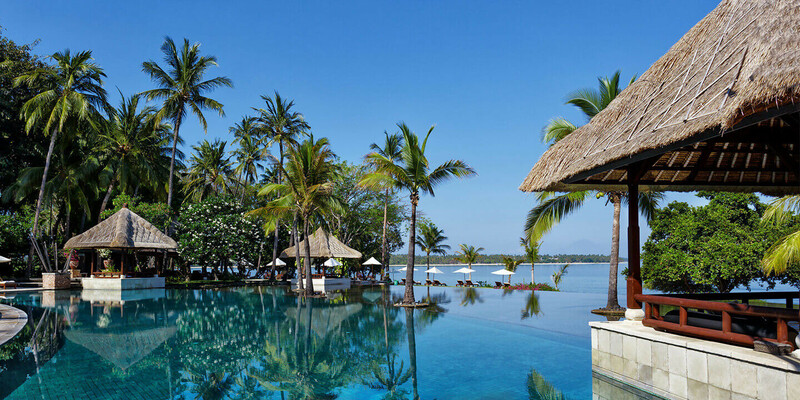 Reflecting pools and a 40 metre swimming pool stretch from the open air lobby to the tranquil waters of Medana Bay. 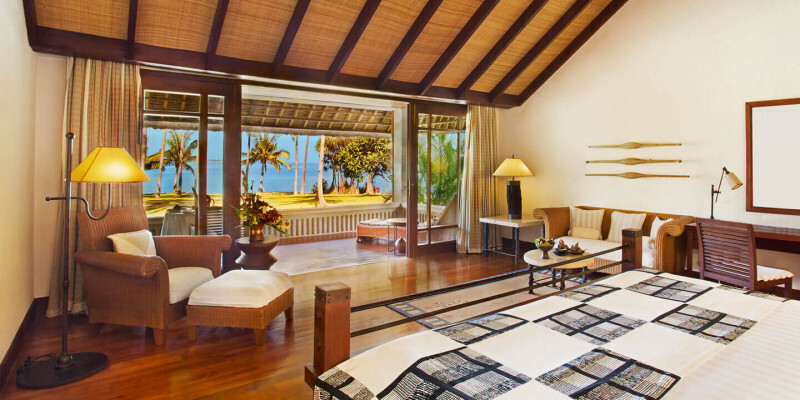 Large air-conditioned bedroom with en-suite bathrooms. Most Villas have a swimming pool within walled courtyards. Famous for colourful coral reefs and scuba diving. 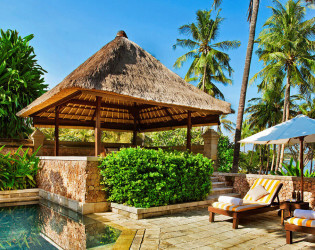 The Oberoi, Lombok would be more suitable for those who seek a serene, tranquil, peaceful ambiance and those who are seeking an experience stay within traditional style of resort in Lombok Island. 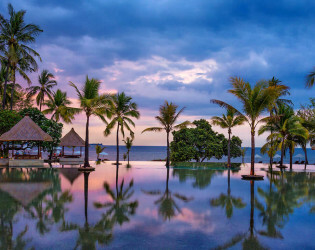 Watch the beautiful sunset from the pool. 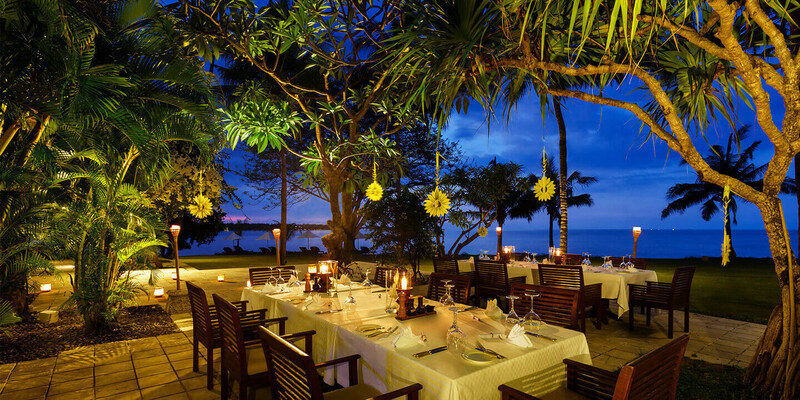 Two restaurants offer a variety of international cuisine of the highest standard.